Myth and media typically cast animals we consider predators or carnivores as unthinking killers—dangerous, unpredictable, and devoid of emotion. But is this portrait valid? By exploring their inner lives, this pioneering book refutes the many misperceptions that hide the true nature of these animals. We discover that great white sharks express tender maternal feelings, rattlesnakes make friends, orcas abide by an ancient moral code, and much more. Using the combined lenses of natural history, neuroscience, and psychology, G. A. Bradshaw describes how predators share the rainbow of emotions that humans experience, including psychological trauma. 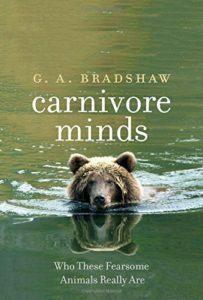 Renowned for leading research on post-traumatic stress disorder (PTSD) in elephants and other species, Bradshaw decries the irrational thinking behind wildlife policies that equate killing carnivores with “conservation.” In its place, she proposes a new, ethical approach to coexistence with the planet’s fiercest animals.